We want to care for our neighbours, here in Linlithgow and the surrounding area as well as in the world beyond. The vision of St Peter's congregation is to actively pursue an extension to our Christian and community life through proclaiming the love of God. The Episcopal tradition of worship and community has existed in Linlithgow for at least 900 years. After the Reformation, Scottish Episcopal worship continued in Linlithgow in meeting rooms throughout the royal Burgh, as part of an independent Scottish Episcopal church, ultimately within the Anglican community. For 87 years our church has been contributing to the life of the Linlithgow community through providing a place of worship for the Scottish Episcopal (Anglican) tradition at St Peter's (originally St Mildred's) church, and as a focus of welcoming social and religious life. We are happy to open our doors to those who want and need to walk through them for varied reasons: those seeking advice and help from our Rector, those who want some peace from the pressures of their daily lives, those who need warmth, food or a hot drink, those who step in to join our services occasionally or those who want to use our facilities for a gathering of their own. build capacity to host current and planned activities: community gatherings, ecumenical faith groups, music, cultural activities and 'reach-out' programmes for our community. We have consulted extensively with our congregation and local community on these objectives. Our efforts to reach out to the local and wider community are currently hampered by what can only be described as woefully inadequate facilities. Because of limited space in the kitchen, we cannot prepare food for the hungry or offer the disabled access to a toilet. We are therefore severely limited in being able to offer use of our church to many in the community who would want to do so. At this time young parents have nowhere to change their little ones, members of the congregation with physical difficulties cannot access the toilet at all and the older members find it too embarrassing to reach the toilet through the narrow bustling space that is our kitchen/vestry. Storage for small items of equipment (e.g. room to slot in folding tables) and space to hang outdoor clothing. This work will not impact on the Memorial Garden, which must remain intact and undisturbed. Such an extension would be a wonderful benefit to not only St Peter's Congregation but to those in our community who want or need to use this small church. Who is going to help us do it? After studying at the University of Edinburgh, Grant gained experience working in London and around Edinburgh before setting up his own practice. Grant Bulloch is registered with ARB, is chartered with the Royal Institute of British Architects and was elected a Fellow of the Royal Incorporation of Architects in Scotland in 2008. The practice is also a member of ECAN (Edinburgh Chartered Architects Network). Outside the office, Grant is a trustee of the Kisoro Trust, a registered charity which supports a primary school for deaf children in Uganda and is also a director of The Ripple Project, a charity organisation supporting people of all ages in his local community. He is also heavily involved in the life of his own church, St. Paul's & St. George's in Edinburgh. Inspiration for design comes from many places. The landscape, the culture, the urban surroundings, the site itself or maybe even the clients. Regardless of the source, Grant Bulloch has a passion for using that inspiration to come up with creative solutions with an emphasis on contemporary architecture, and is committed to design excellence whatever the nature or size of the project. Context and the environment is always considered, and where possible a sustainable approach to building is explored. However every project is still tailored to suit the individual client and the professional design team chosen to suit the requirements of that project. The practice often collaborates with other designers when the opportunity arises. The use of natural materials and the creative manipulation of space, light and colour is encouraged. The aim is to create inspiring places, where people enjoy living and working. "To create improved toilet and kitchen facilities, along with a meeting room, this project is small but very challenging. The proposed use of these new rooms sounds mundane, but they will transform the church's ability to meet the needs of the community and congregation. "I imagine a structure which will have to be lit almost entirely from above, therefore the roof will need to be designed to accommodate openings which will create light filled and inspiring spaces below. "The garden also provides a huge opportunity to create a greater relationship between the church building and the external landscape behind it. Whilst not something specifically mentioned in the brief, the opportunity now presented to St. Peter's would be worth investigation. "If funding permits, it is suggested that a small outdoor space either on the roof or beyond it is created to recognize the memorial ground and make a place where services or meetings can happen, surrounded by the trees and landscape. Although the space has been used for this before, improving access and facilities would encourage its use. Having some part of the roof glazed would therefore not only allow light in, but would provide glimpses of activities either outside or inside, strengthening the relationship between the two spaces." At the time of writing (Winter 2016), members of the congregation had already pledged more than £35,000 to support to build, which was at that stage expected to cost something in excess of £100,000. We have an enthusiastic team of volunteers who are organising a programme of bids to charitable foundations and trusts. We also hope to raise further funds by sponsored events such as Sunday school children's sponsored walk, 'buy a brick' and safari suppers. We have had many messages of support from other local Linlithgow organisations. 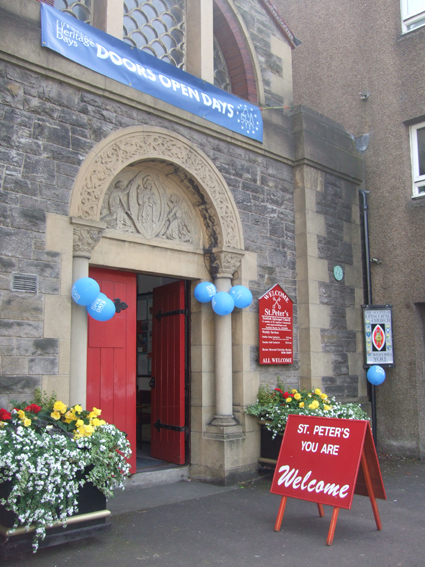 St Peter's Scottish Episcopal Church Linlithgow: "The little High Street church with a big heart"